Little Bit Funky: no words needed. When we were done I took a photo of him on my phone and then showed him...he gasped a little and reached up to touch his head with both hands like he had no idea what was going on up there. We're hoping for a Samson kind of effect...you know, like maybe his naughty was stored in his long blonde locks? How's it going with the Samson effect? :) He is so handsome, with or without so much of that hair. My nephew had his first haircut around his first birthday but i dont think he appreciated it then. It's about time he got another one and I can imagine how tough it would be to get him to sit still! He looks so much like his brother now! You have very handsome boys. Gorgeous fellow! I'm quite sure that little boys do store at least a tiny bit of naughty in their long locks. oh how handsome! turned from a boy to a big ol' man before our eyes! what a wonderful memory to capture! i LOVe his haircut! i would love to do the same to my son... what number guard(s) did you use? thanks! wow he looks such much older without all his blonde hair! what a cutie! He does look a lot older and like his brother! 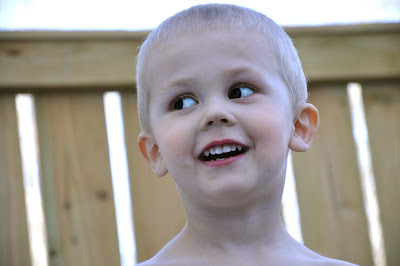 My oldest is 4 and has had longer hair since he was little (it usually has curl and is cute). I'm no way brave enough to cut it off. I think I'd cry. I asked him a little while ago if he wanted it cut short and he said "No! I like my curly hair!". You're a lot braver than I! A D O R A B L E!!!!! !